Cody, Wyoming is located just 52 miles from the east entrance of Yellowstone National Park, in beautiful Park County. The Cody area, also known as Cody Yellowstone Country, is famous for its proximity to Yellowstone National Park, spectacular scenery, exciting history, and for its world-class museum, The Buffalo Bill Center of the West. Within Cody Yellowstone Country is the nation’s first national park (Yellowstone), first national forest (Shoshone), and a series of historical and entertainment attractions that make it one of the world’s leading travel destinations. Cody was founded in 1896 by the living legend, Colonel William F. “Buffalo Bill” Cody, who at the age of 41 was one of the most famous men in the world. Cody, variously known for his exploits as Pony Express rider, scout, hunter, entrepreneur and showman had become the friend of presidents and kings, senators and governors and many of the country’s most influential business people as a result of his genius and showmanship. Cody’s “educational expositions,” better known as “Buffalo Bill’s Wild West Show,” captured the international public’s imagination. The exposition toured the world for thirty years. His exploits and accomplishments are in plain evidence throughout the area. 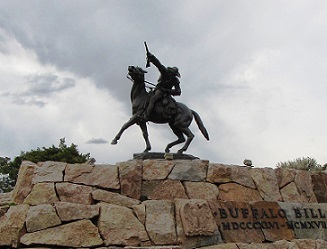 Perhaps the greatest asset of Buffalo Bill’s home town of Cody is the continuation of the spirit of individual accomplishment, western hospitality, honesty, and friendliness of the citizens. The spirit that was instilled in the early settlers by the “Old Scout” still prevails and is manifested today on the streets and in the homes of Cody Country people. Cody is 52 miles east of the east entrance to Yellowstone National Park and 81 miles south of the northeast entrance to Yellowstone.